SpaceX has shared a dramatic video of the Falcon 9 booster’s crash landing on a ship in the Atlantic Ocean after the rocket’s successful Jan. 10 liftoff with supplies for the International Space Station. 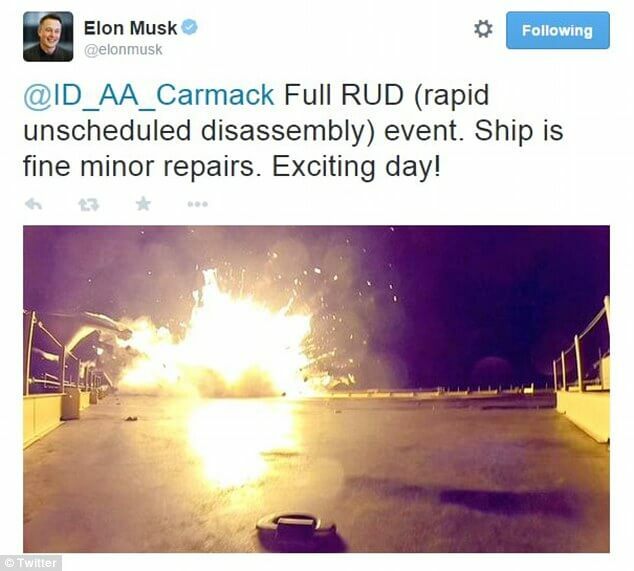 SpaceX founder and chief executive Elon Musk posted images from the video on Twitter early Friday, offering commentary on what happened as the 14-story booster descended to a landing barge in the Atlantic Ocean. The rocket’s first stage descended back to Earth after a nearly three-minute burn to send a Dragon supply ship into space. While the Falcon 9’s upper stage pushed the Dragon spacecraft into orbit, the first stage re-ignited a subset of its nine Merlin engines three times in a flyback maneuver aiming for a precise vertical touchdown on a specially-outfitted vessel 200 miles northeast of Cape Canaveral. The 14-story booster extended four landing legs and used four grid fins for aerodynamic control on descent, but Musk says the small winglets ran out of hydraulic fluid moments before landing. The rocket lost control and disintegrated in a fireball at impact. The 300-foot-long ship used for the landing attempt returned to port Jan. 12 in Jacksonville, Florida, showing no obvious signs of damage. Containers housing support equipment on the barge’s deck were blackened and crumpled from the blast. SpaceX is trying to land a Falcon 9 booster in a bid to make the rocket reusable. The unprecedented flyback to a landing barge had never been tried before. SpaceX plans another reusability experiment after the Falcon 9’s next launch with NOAA’s Deep Space Climate Observatory, currently scheduled for Jan. 31. Tory Bruno, president and CEO of SpaceX rival United Launch Alliance, responded to Musk on Twitter, apparently offering help from ULA engineers who worked on an experimental reusable vertical takeoff and landing rocket named the Delta Clipper. The Delta Clipper was designed by McDonnell Douglas — now Boeing, one of ULA’s parent companies — and flew short hops in the 1990s with funding from the U.S. Defense Department and NASA. Have to respect the interest that SX has brought to Space. Good luck next time.